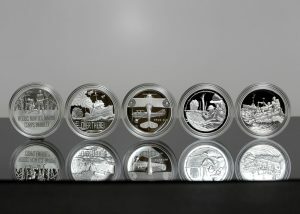 Collectors can again order the five 2018 World War I Centennial Silver Dollar and Medal Sets. Limited to 100,000, the sets launched on Jan. 17 and originally had an ordering deadline of Feb. 20. Today, the United States Mint reopened sales of all five sets at their initial issue price of $99.95 each. There’s no word on how many sets are available or for how long their sales will continue. The medals feature designs emblematic of the Army, the Navy, the Air Service, the Marines and the Coast Guard. 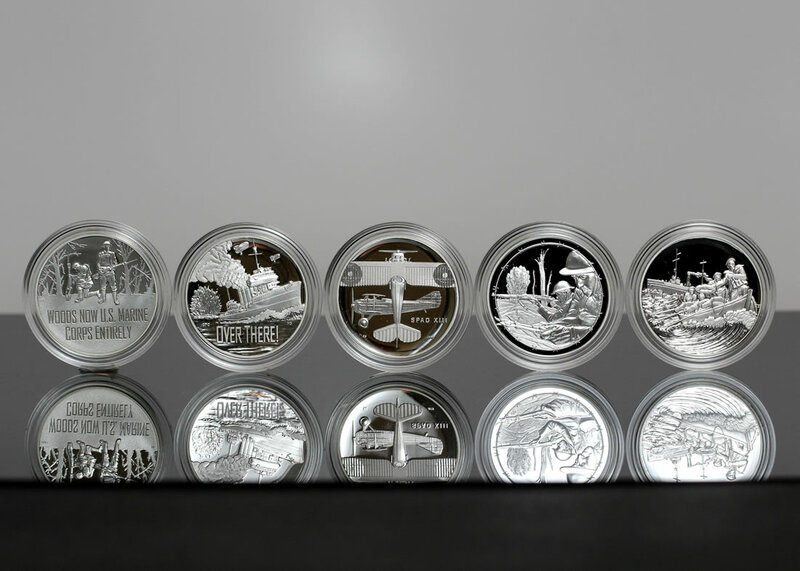 Conceived by the U.S. Mint to support the WWI Centennial Silver Dollar Commemorative Coin Program, each medal is paired with a proof WWI dollar and sold as a distinct set. Sales figures of all five sets had been declining since their Feb. 20 deadline because of returns and cancellations. That’s no longer the case. Last week’s U.S. Mint sales report had each set advancing by an average of 73 units. This week’s report shows gains ranging from 15 units for the Coast Guard set to 52 units for the Army set. The following table shows sales totals of the sets shortly after their initial ordering deadline and as of this past Sunday, July 29. The differences may suggest about how many sets could be available. Buy the sets from the U.S. Mint’s commemorate section right here. There was a 2/20/18 cutoff date for these coins and that was suppose to be final. Is the US Mint lying to the customers by putting them back on sale after the cutoff date? Looks to me like they are talking from both sides of their mouth. Leaves me disappointed, Oh well. OH, What a rotten deal this is for anyone who bought these in the initial offering for their like of the series AND the hopes this was to be a good venture of an investment. I did not buy these, but if I had I would be livid! What a dirty trick the Mint has pulled here! Another MAJOR phuckup & destruction of any semblance of honor @ the USM. HAs Trump taken over the USM 100% cause they are LIARS & CHEATS & FRAUDS, not saying he is, but appearances count. Why would I or anyone else ever buy any “limited” edition or a mint to order item, when the mint schmucks decide they made toomany or they sucked eggs & got rejected by stoned collectors even (buying that ugly, non ergonomic, totaly junk self-portrait WW1 slug….) The Mint is committing more suicide daily it seems…..
Trump would have melted them all down and gave the money to Hillary to buy more crying towels.She could use them to go for long walks in the deep woods. Again, the same old story. The flippers bought these last February in hopes of doubling their money overnight. Once reality sets in, they return immediately. It appears the US Mint is simply selling the returned merchandise. Most of the returns are by people who had no interest whatsoever in the coins. As long as the final mintage does NOT exceed the numbers reported on February 25th, there should be no problem. It is probably more cost effective. I doubt if the re-release of 1700 returned Coast Guard sets is going to cause the price to move one way or another. I too am very disappointed with the reopening of sales! If they did not appeal to the public and sell out they should meltdown the remainder and use it for eagles or other silver coins with no controversy with the collectors that waited for sells to open, rush to purchase before selling out or timeline expiring! I am really upset that what should have been a great addition to a collection and a investment gone sour! Trump understands investments and should have put his opinion into this decision to open sales again! I bought my set on the first days of sales and now wish I could return them as they are worthless to me now! I do not know legal language, but I bet there is a legal case of fraud to the public by the USA Mint and government for allowing this to happen!!!!! These are simply reselling the ones that were already bought but returned. They “sold out” of the ones they made because they only made how many were purchased. If you want to return yours I am sure you still can. They’ll just resell it too. Silver @ about $15.50, And selling an ounce for $100.00. I really don’t know why anyone is crying…they are not making more, just reselling, in fact am glad because it punches the flippers right in the gut. Now no one should pay a premium for what is available at the mint. The mint pulled this same trick on the 2005 or 2006 silver proof set. After sales closed, and there was a bit of a profit to be made in the secondary market, they reopened sales and flooded the market with them. Can’t trust these jerks.